The Xiaomi Mi 3 is import only, so is it worth shipping? A unique design and brilliant performance, made all the better by the polished and comprehensive MIUI interface. A budget winner, if you can find one outside of China. Xiaomi (pronounced "Shiao Me") has been mentioned a few times before on TechRadar, regularly picked out as "one to watch" for the future as the emerging smartphone brand becomes more widely known. That's for two big reasons: it has a reputation for making good phones at very low prices, and the fact that former Google/Android man Hugo Barra joined the Chinese maker last year to head up an international push. It's an interesting company. It sells mobiles direct to customers via its website, so the money it saves on marketing pushes is passed on in offering solid hardware at a budget price - it's not too dissimilar to the OnePlus One in this respect. Xiaomi's current high-end model is the Mi4, but before then it was the Mi 3 and it offers specs similar to those of most of 2013's flagship Android models, combining a 2.3GHz Snapdragon 800 chipset (as seen in the Nexus 5, LG G2, Xperia Z1 Compact and many, many more top-spec mobiles) with a 13MP camera, 2GB of RAM, 16GB of internal storage and a 5-inch 1080p resolution display. In terms of what's inside it, the Xiaomi Mi 3 is very nearly as good as it gets in the world of on-paper performance, if you ignore 2014's brand new models with their superior Snapdragon 801 chipsets. There's a catch, though. Xiaomi hardware is not officially available outside of China, so buying the Mi 3 or its cheaper RedMi model in the UK, US or Australia, means paying someone else to source them, import them, and pass them on at a significant mark-up. Happily, though, the Mi 3 can be bought from around £229 (about US$390, AU$415) online including taxes and delivery from several import suppliers, meaning that even after eBay and the sellers have made a few quid there's a substantial price saving to be had. The Mi 3 is pleasingly thin and angular, with a squared-off look from the front accompanied by curved plastic sides, which seamlessly round into the unibody casing. I like it. It's minimal and futuristic looking, if not more than a little reminiscent of the Nokia Lumia 900. It does manage to avoid the common fate of looking like a Samsung Galaxy clone that afflicts many budget smartphones. There's a big speaker grille at the bottom, with microUSB connector to the side. I'm not massively keen on this trend of placing speakers in the bottom edge of the phone, as it means sound gets muffled very easily by your hand when holding it in landscape to watch media or play games. The top edge of the Mi 3 is also clean and sharp, housing access to the full sized sim car, with the 3.5mm headphone jack alongside it. Power button placement is of the standard right-hand variety, with volume up/down toggle above the power button. The notification light can blink in different colours, plus there's an option within MIUI to specify personal choices. It can blink red for SMS messages, blue for incoming calls and so on. It's great to see hardware and software working together as well as they do in the Mi 3. It's slimmer and lighter than Sony Xperia Z2 and, for my money, has more to it style wise than the Huawei Ascend P7, the latter of which is probably the nearest competitor to the Mi 3 in terms of budget brand promises. The Mi 3 feels like a solid, high-end piece of kit. There's a lovely bit of detailing where the glass of the screen meets the bottom of the phone, with the bezel overlapping the corner a little and creating the impression that there's a thick lump of glass on the front of the Mi 3. The main negative here is the decision to use capacitive touch buttons instead of using Android's on-screen software buttons that have been widely used for a couple of years now. 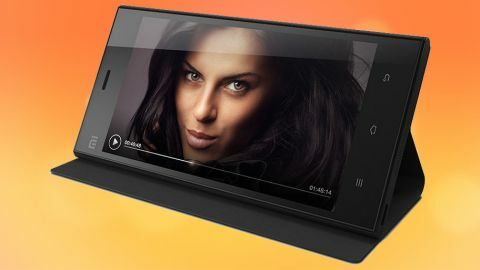 This is no doubt down to the fact that the Mi 3 runs the popular MIUI software, a thorough and comprehensive reskin of Android 4.3. It feels like these buttons are organised backwards. When holding the Mi 3 in the right hand there's a bit of a cramped squeeze to get to the back key, a button used much more widely than the easier to reach menu. That said, if you hold your phone in your left hand it's ideal. Perhaps Xiaomi has its eye on the left-handed phone market? Also, despite Xiaomi going to great lengths to point out that the Mi 3 comes with an "aluminum-magnesium alloy frame, coated with 3 layers of thermal graphite" it feels like it's made from plastic. Decent and solid plastic, yes, but perhaps not quite up there with Apple and Sony in terms of impressive, premium feel.